Have you’ve felt like your current workout routine just isn’t cutting it? Have you wanted to take it up a level or two? If so, you need to consider making the switch to CrossFit. Why? We’re going to get into ten of the biggest differences between CrossFit and your standard workout plan. Once you’ve decided to give it a shot, call CrossFit Stimulus to reserve your spot in our Jump Start Program! Our talented and experienced trainers are here to help you get a body you’re proud of. Possibly the greatest strength of CrossFit is the broad scope of training that it involves. Whether it’s running to boost your endurance or weightlifting to build muscle, you’re going to constantly do something new and different, yet hugely beneficial. Thanks to its “Jack of all trades, master of none” training style, CrossFit has a wider focus to create overall strength and fitness instead of focusing on one or two sections. It means you’re going to get faster, stronger, and overall better at many more exercises. This will also give you the experience to increase a focus on a certain area in the future if you want to. With the wide variety of exercises involved in CrossFit, you’re never going to get bored with your workout. Every day you work out will be something new, which keeps you engaged and excited — you can’t say the same about other basic routines! This will also help you find a more well-rounded result in your fitness. CrossFit has a pretty easy methodology to understand: “routine is the enemy”. You could go into a CrossFit gym every day for months without repeating the same workout. Most CrossFit programs design their workouts based on 25 to 30 movements, which are constantly changed to vary their style, amount of reps, amount of time, and their relation to other exercises. One of the biggest strengths of CrossFit is how it consistently checks in with your progress with built-in benchmarks. Though these benchmarks can vary between different facilities, they all retain the goal of pushing you to your next milestone. One such benchmark requires you to do 100 pull-ups, 100 push-ups, 100 sit-ups, and 100 squats. While that sounds like an impossible task when you’re first starting out, it is by no means your first benchmark. You’re going to be working up to that level to the point that, when you do reach it, it will be within your ability to achieve it. Walk into your standard 24-hour gym and you’ll see a pretty familiar sight; people silently working out while they have their headphones blocking out the rest of the world. While that may work for some people, CrossFit encourages interacting with each other. To some people, it can look like a cult-like following, but in reality, it’s something closer to a modern-day social club. When you have people working out with you, it creates a camaraderie between everyone as you train and push each other to keep going. You’ll also have a network of accountability that makes you feel responsible for your success, along with the success of your fellow CrossFitters. You’ll also be meeting like-minded individuals that you can relate to, which can turn into strong friendships. While other exercises are functional in their own way, the main goal of CrossFit is to improve your life overall. Everyone from police officers and firefighters to professional wrestlers and military personnel see incredible results that translate directly into their everyday life. Exercises that mimic your body’s natural movement patterns like squats, bench-presses, and sprints can make daily events like catching the bus easier for you. 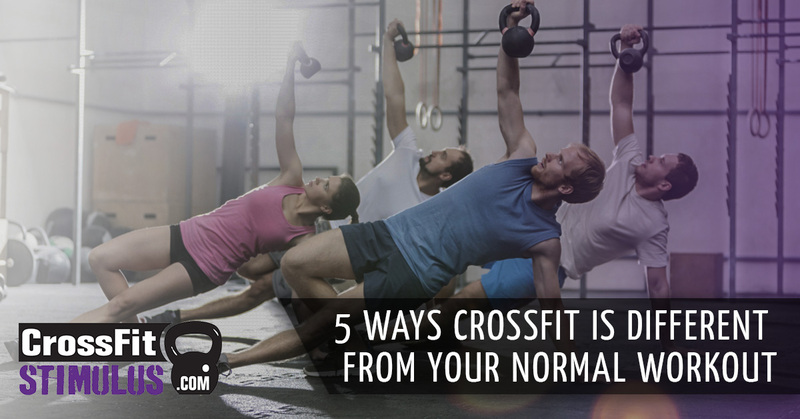 If you’re ready to ditch the doldrums of basic exercise, CrossFit is right for you. You’ll find an overall balanced level of fitness that standard routines just can’t provide. It’s functionality and social interaction set it apart, making it the workout of choice for more people every day. Not to mention you’re going to be engaged and excited every day, so you can say goodbye to boring workouts you’re snoring through. Now that you’re ready to jump in, call CrossFit Stimulus in Newport News to join our Jump Start Program. Make the change and see the results yourself.